Custom Bath & Body Works Hand sanitizer holder! Great for backpacks, purses, key chains and more. Many colors! Personalization! Durable! Provide name or image request here. Also request color for holder here. 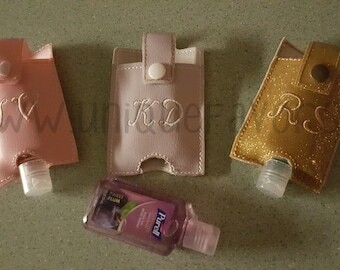 This hand sanitizer holder holds the uniquely shaped Bath & Body Works hand sanitizers shown. It's made from heavy-duty vinyl with a coordinating snap on top. Add a keyring or lobster clasp if desired. I made these for teacher gifts for my kids. They are great for summer camp too! Perfect for sports bags, nurses and gifts. The possibilities are endless. These are much more durable than the plastic styles available. Personalize the holder if desired. I can do an initial, monogram or name up to 8 letters only. Attach to a backpack, tote bag, keychain or purse! This is a custom item to fit the specific shape of the sanitizer shown. Slip the bottle through the opening at the top with the cap facing down. **Sanitizer not included. Great for shipping direct to gift recipients. Please choose below the options. There are options shown BLANK (holder without adding a name) and then below that are optional add-ons that include personalization with a name embroidered on the case. You can also add small images. I have sports, beach, flower, butterfly and ladybug images that will fit on the sanitizers. Feel free to message me for requests. This item created with the utmost attention to detail in my smoke free studio. There are no returns or exchanges on handmade items. Hand sanitizer holder 1 ounce, Great for backpacks, purses, keychains and more. Many colors & Personalization! Bunny Hand sanitizer holder. Great for backpacks, purses, keychains and more. 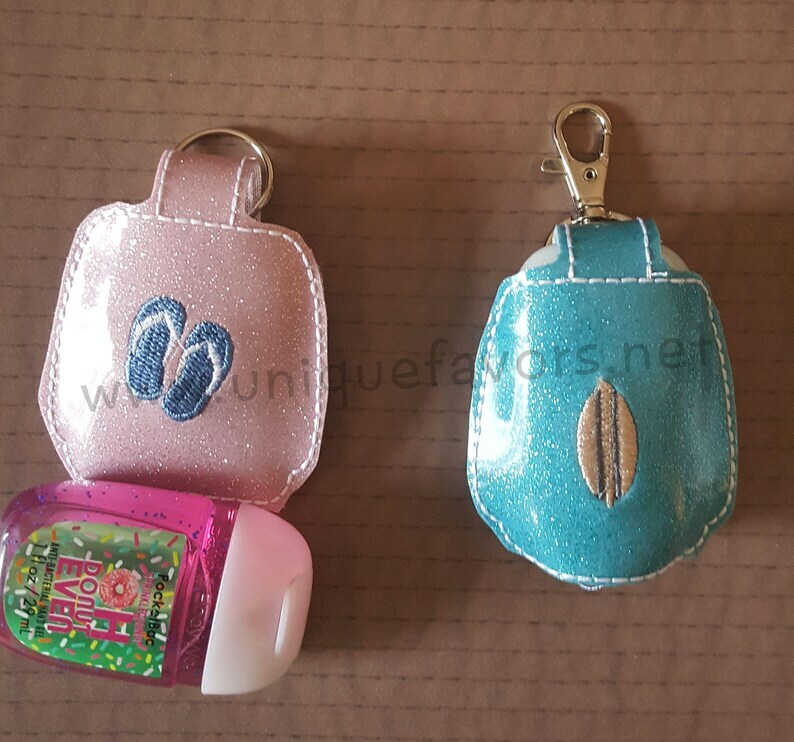 sanitizer Case - Travel - Keychain - Pick Your Color! 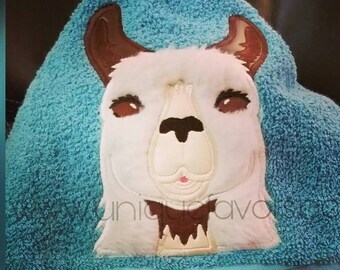 Llama - Alpaca Hand sanitizer holder. Great for backpacks, purses, keychains and more. sanitizer Case - Travel - Keychain - Pick Your Color! Pet Lover Keychain Lipstick or Chapstick holder Great gift for teachers friends family. Hang on Backpacks, purses & more. 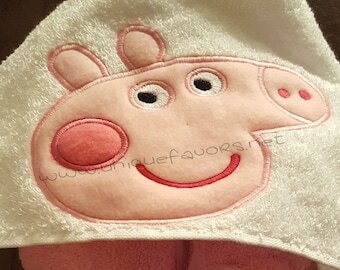 Personalize too! Dance Keychain Lipstick or Chapstick holder Great gift for teachers friends family. Hangs from backpacks, purses, keychains & more! Flip Flop Keychain Lipstick or Chapstick holder. Great gift for teachers, friends, family. Hang from backpack, purse, etc. Personalize! Baseball Water Bottle Holder with Personalization! Many other uses and sports available. Perfect to hang on the fence at the field! Durable! 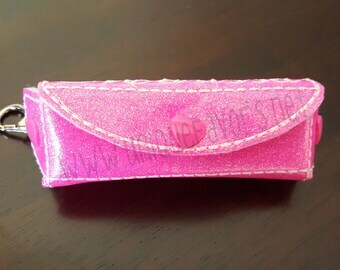 Chapstick, Lip Balm Holder, Lobster Clasp Clip, Snap Closure, Vinyl in Your Choice of Colors & optional personalization! Penguin Keychain Lipstick or Chap stick Lip Balm holder Great gift for teachers friends family. Hang from backpack, purse, etc. Personalize!